Her parents gave us an Instant Pot for Christmas last year. We love it. We’ve never had such good yogurt as the stuff we make in it. It gives us great chili, and pulled pork, and chicken stock. I’m not completely expert at using it. I haven’t yet got brown rice to come out as tender as it would from a saucepan, or chickpeas from the slow cooker. Maybe I’m rushing things–but if the whole idea of a pressure cooker is that it works faster than other cooking methods, then I think it really ought to be faster. Our CSA share hasn’t been piling on the carrots and parsnips quite so much as it was for a while there, but we’ve still got quite a few, and some nice potatoes. 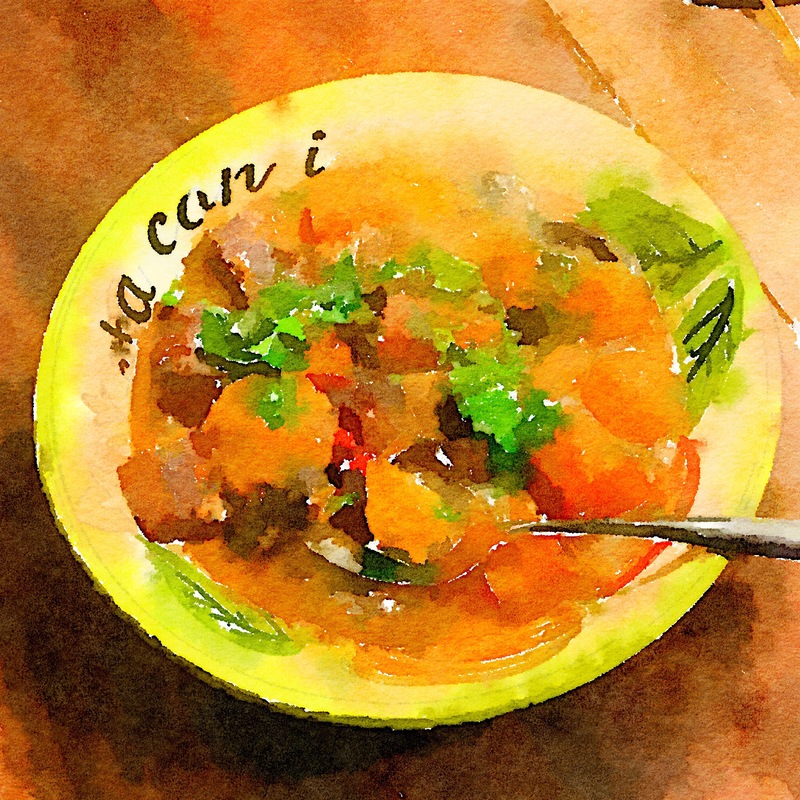 And, with a bit of chill in the evening air of late, stew seemed like a good idea—and a perfect job for the Pot. I seared the beef, I chopped the veg, I added seasonings and wine, closed the lid and headed for rehearsal. And, unfortunately, the gravy separator had melted in a stovetop accident sometime during the holidays last year. (We don’t make gravy very often.) Ever-resourceful, she refrigerated the solids in one container, the liquid in another, and made mac and cheese for her dinner. When we got home the next evening–a rare night home together!–I skimmed the solidified fat, made a roux, and used the broth to make a nice, hearty gravy. 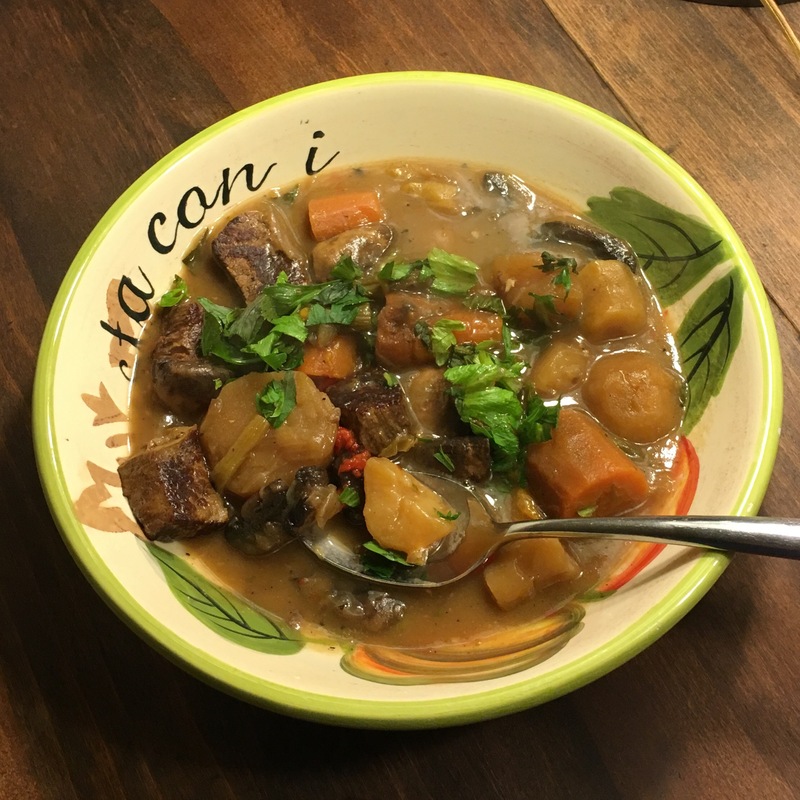 I warmed the meat and veg, added them to the gravy, topped the stew-at-last with some chopped celery leaves, and we had dinner in not quite an instant. Some things happen in a flash. Some take a very long time. Sometimes it’s a little of both. We’d known each other for ten years before our first date. This entry was posted in Dinner, Uncategorized, Veg Box Chronicles and tagged Beef, Dinner, Gravy, Stew, Vegetables. Bookmark the permalink.